The Shivah is another brilliant piece of work by Dave Gilbert, creator of both Bestowers of Eternity and Two of a Kind. A few things are done differently in this murder mystery, for example there are no puzzles requiring the use of your inventory and practically no items to collect. Story progression is usually achieved by extracting clues from conversations with other characters. 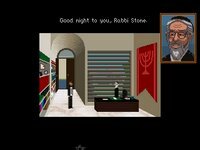 A rabbi had received a large sum of money from a former member of his congregation, and being extremely suspicious the man decides to investigate the origins of his good fortune. Great stuff, even the final confrontation is a showcase of excellence in design.